Kick up your feet and relax with this cozy ottoman. Featuring a simple look of a tapered block legs, clean edges and a rectangular silhouette, this ottoman can fit in well with any setting. 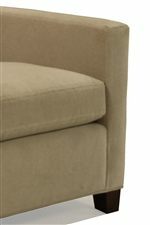 Its cushioned top provides the ultimate place to set your feet after a long day. The 1050 Ottoman by McCreary Modern at AHFA in the area. Product availability may vary. Contact us for the most current availability on this product. The 1050 collection is a great option if you are looking for furniture in the area.